Year 2 Video Conference With Friendship School in New York State. Following up our exciting Video conferences with New York, 2Vo had the wonderful opportunity to link with Friendship School in New York State. The children at Friendship were excited to share all the wonderful activities they do and they gave 2Vo a really good understanding of their daily lives. Many questions were asked by the Highlands children showing the interest but also the great job Friendship did in sharing such interesting information. 2Vo shared their learning about London and what it is like for them to live in the capital. Many of the children were able to speak without scripts and were very confident, which shows again how deeply their learning has impacted them. The children even managed to share the meaning of a 'Rights Respecting School' to their Friendship counterparts. This Video Conference was hopefully the beginning of many between the two classes. 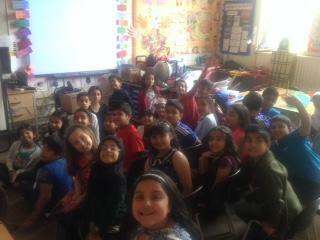 During the last week of the half term, all of year 3 took part in video conference with Redbridge Primary. The conferences gave the children the opportunity to showcase all of the fantastic learning they had done in the past term. Year 3 were highly knowledgeable in sharing information about the Arctic and even their relatively new topic, London. The different classes shared, written work describing the events of 'The Great Serum Race'; 3D models of famous landmarks and wonderfully descriptive written explanations of different Arctic animals. The only thing more impressive than the knowledge and learning the children shared was the fantastic eloquence in which they all spoke. Redbridge Primary gave brilliant insight to everything they have learnt and the Highlands children asked many inquisitive questions. The year groups have planned to further this Video Conference by organising a picnic in the park. Giving the children the chance to ask more questions and get to know the children they have learnt with. Year 3 (3FO) had the opportunity to take part in a video conference with West Valley Central School, which is on the outskirts of New York City. The West Valley children shared information about their daily lives. Many of the children lived on farms and had stories to tell about all the animals that they have come across and the jobs that they help out with. 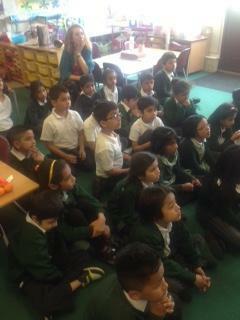 3FO were gripped by the interesting and different stories that were shared. West Valley school is an hour away from New York city and the children also had experiences of visiting iconic places such as the Statue of Liberty and Times Square. 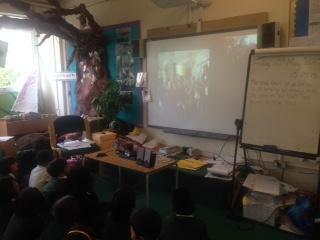 For the second half of the video conference the children of 3FO shared their likes about London and their school. The children spoke beautifully and confidently and proudly represented Highlands. The two classes finished the video conference asking questions. The interest from both classes meant that some wonderful questions were asked. The children really got to see how different and similar life is 'across the pond'. The conference was a success and the children learnt about American life from children their own age, all made possible through the power of video conferencing. The Year 5 children have been studying the topic of space. They took part in a video conference with the National Space Centre, who offer a variety of video conferences to support this topic. The children took part in a video conference called:- Ask the Expert. The children emailed their questions to the National Space Centre. The video conference was with Commander Kate from the Space Centre and she answered each question giving extremely full explanations, using pictures, animations and film clips to describe why and how. This was a fantastic interactive session where the children learnt about stars and their formation, planets, life in space and how the astronauts live on the International Space Station; what they eat, how they wash and go to the toilet! Everyone really enjoyed the session.. This was a really good VC and well worth booking. Click HERE to find out about the video conferences available to book with the National Space Centre.